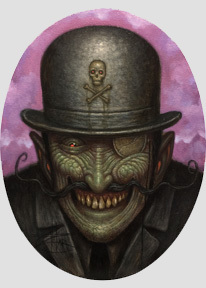 Opening Reception: Saturday, October 13 , 2018, 8:00 – 11:30 p.m.
Copro Gallery presents 'VILLAINS', a solo art exhibition by Chet Zar. There will be 10 Villains oil painting by Chet featured in hand made sculpture frames featuring the Devil. Under the Villains umbrella 4 other artists will also present mini solo shows Dos Diablos, Amandine Urruty, Shane Pierce and Magpie Rodgers. Says Chet about the exhibit, "I want to pay tribute to “The Villain” archetype by creating my own painted versions of classic villains. The Mad Doctor, The Evil Clown, Demented Priest, Killer Robot Et al. When I was a kid, I liked the villains in movies more than I liked the heroes. They were so much more interesting and colorful and as we all know, every great story has a great villain! I think by examining the great villains of our collective psyche we gain greater insight, by contrast, to our own better nature. In her second mini solo show exhibit with Copro Gallery Amandine Urruty presents an interrelated body of work dealing with the 7 Deadly Sins under the 'Villains' umbrella. Amandine lives and works on her bed at home, with a suit case full of pencils and pens always nearby. 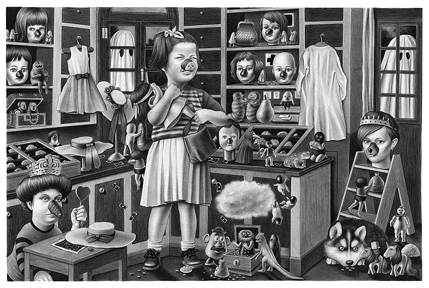 After studying at the University for many years and a brief career in underground music, Amandine Urruty spread her repertoire of beasts and gallery of weird characters on all kind of mediums, papers and walls. As she masters techniques of traditional drawing, Amandine offers us a cheerful gallery of deviant portraits, associating grotesque outfits with baroque decorum which miraculously reconciles lovers of alchemistic symbolism to young ladies with too much make up. Indeed, Amandine builds her images like we would wander in the alleys of a Sunday flea market, borrowing from the mass of objects and second hand toys with their fundamental ambivalence, being wicked & peaceful, decorative and saturated at the same time. 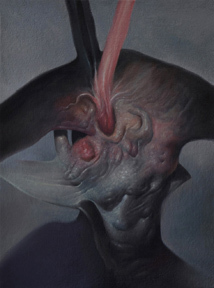 Dos Diablos, 'Employee of the Month', oil paintings enter into the Villains umbrella with a body of work that might make you a little squeamish but Don't Look Away! Jorge (Dos Diablos) was born in Guadalajara Mexico (1982). His art carreer started as an editorial illustrator, working for several Mexican newspapers and magazines. His illustrative collaborations range from posters, music album covers and book designs. Jorge's fine art career began as a result of restlessness, inner emotions and social conflicts. His critical vision which we see in each of his works evolves into the monster that we each carry with us every day. The work of 'Dos Diablos' transgresses and delights the viewer, leaving us no option but to forge ahead and contemplate our destiny. Jorge works and lives between Guadalajara and California. For his entry into the Copro Gallery exhibit 'Villains' Shane Pierce has created a series of 3 paintings depicting a Ghostrider. Shane Pierce is a self-taught artist born in 1973 in St. Louis Missouri. Shane took to art as soon as he was able to hold a crayon and has been a professional full-time artist for over 18 years. Living in North Carolina he has worked with many studios in the Games Industry including Epic Games, NCsoft, Electronic Arts, Sony Computer Entertainment. His fine art has been exhibited in many galleries throughout the world including previous exhibits at Copro Gallery. Meagan “Magpie” Rodgers is a dark surrealist painter and graphite artist. Originally from Riverside, California, Meagan relocated to Chattanooga, Tennessee for a change of pace and scenery. Surrounded by forest, rivers, and waterfalls, she feels much more inspired and at home. Although her work is dark in essence, she intends to set a spectrum of moods, not just negative. 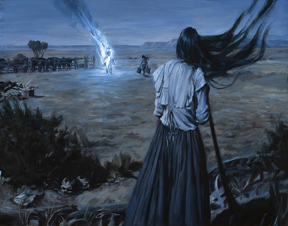 Meagan materializes nonphysical concepts in her work such as paranormal entities and emotions (mostly those brought on or exaggerated by her bipolar disorder), love, and loss.